Despite our expectations, the EUR/USD currency hasn’t been corrected into the area of 1.2665. By the moment the price has got very close to the minimum; there are no reversal patterns at shorter time frames. All these factors indicate that the descending trend may continue. The closest target of the fall is the area of 1.2360. One can consider opening short positions from the current levels with the stop above 1.2575 and increase the amount of sales only after the price breaks the level of 1.2475. If the pair grows up higher than 1.2625, we should expect the correction into the area of 1.27 or even higher. The correction hasn’t reached the area for sales. 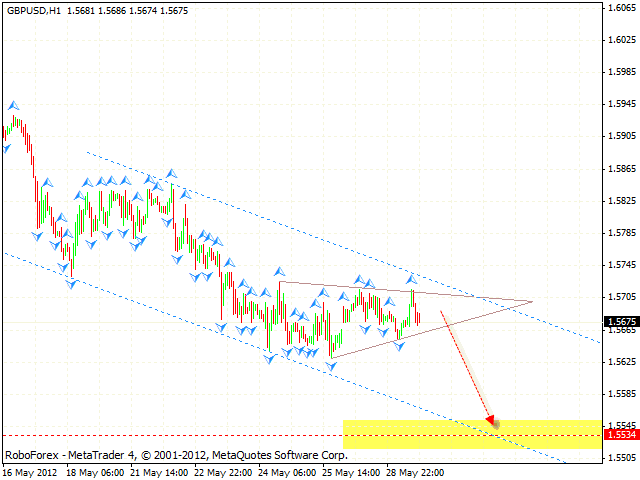 Currently the price is forming “triangle” pattern at the H1 chart of the GBP/USD currency pair. After the price breaks the pattern, the pair will continue falling down. One can consider aggressive sales with the tight stop above 1.5710. The closest target of the fall is the area of 1.5535. We recommend to increase the amount of short positions only after the price breaks the level of 1.5625. If Pound grows up higher than 1.5745, this scenario will be cancelled. 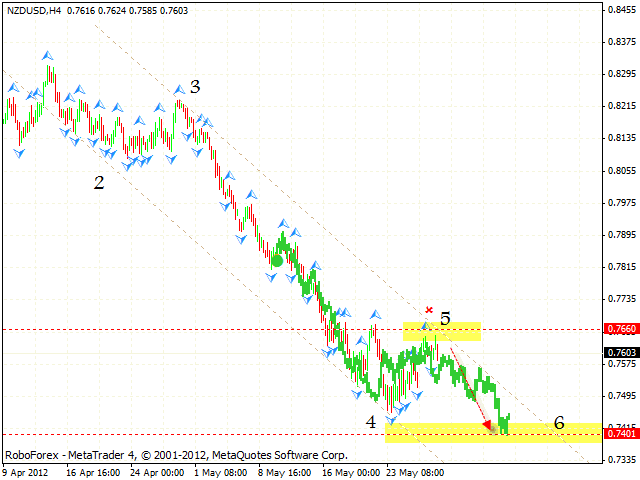 The USD/CHF currency pair continues testing the maximums. 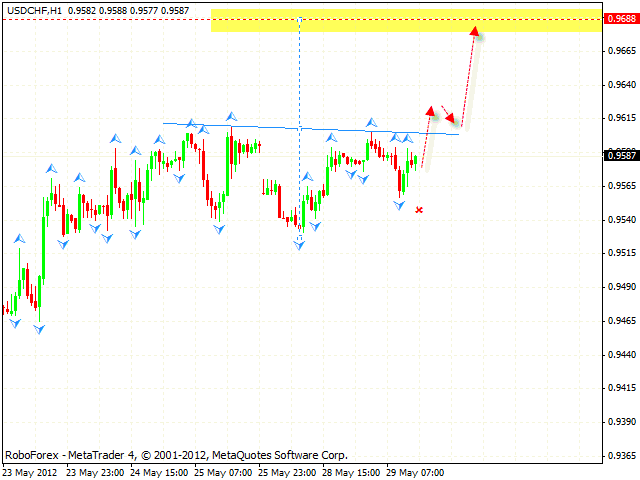 At the moment the price is forming “upside down head & shoulders” pattern, which in this case is a continuation pattern. One can consider buying the pair aggressively from the current levels with the stop below 0.9550 and increase the amount of positions only after the price breaks the level of 0.9615. The target of the pattern is the area of 0.9690. 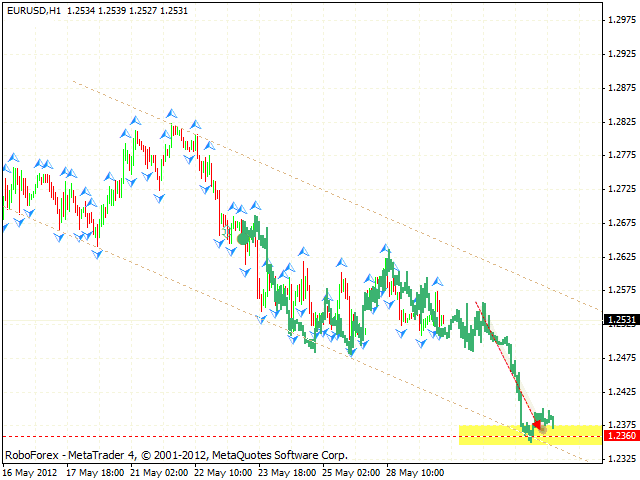 If Franc falls down lower than 0.9515, this scenario will be cancelled. 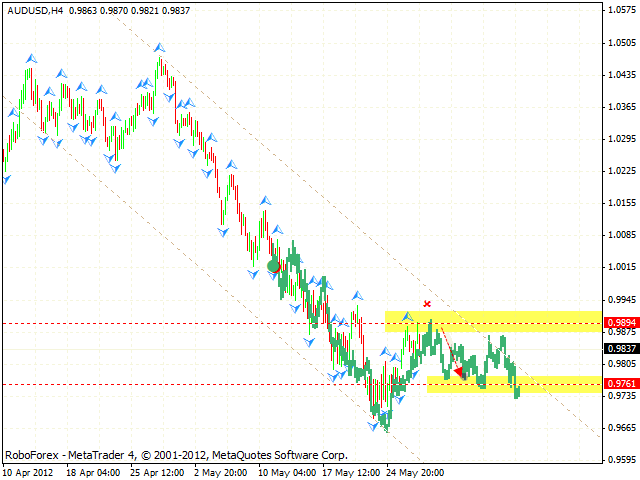 Australian Dollar continues moving inside the descending channel, the situation hasn’t changed much. One can consider selling the pair from the current levels with the stop above 0.9930. The closest target of the fall is the area of 0.9760. If the price grows up higher than 0.9945, the scenario, which implies the growth of the pair, will be cancelled. New Zealand Dollar has almost reached the area for sales, at the moment we should expect the price to continue falling down. One can consider selling the pair with the stop above 0.7690. The target of the descending pattern is the area of 0.7400. If the price grows up higher than 0.7735, this scenario will be cancelled.